Meadows Mills has manufactured stone burr mills since 1902. Meadows stone burr mills, also referred to as grist mills, are designed to grind all dry, free-flowing grains and corn into flour, meal, or grits. The millstones used in all Meadows stone burr mills are cut from Balfour pink granite which is quarried in North Carolina. The millstones operate in pairs with a revolving millstone called the "runner" stone and a stationary millstone called the "bedstone." The millstones are set vertically, a feature unique to Meadows' stone burr mills. Meadows Mills has manufactured stone burr mills since 1902. Meadows stone burr mills, also referred to as grist mills, are designed to grind all dry, free-flowing grains and corn into flour, meal, or grits. The millstones used in all Meadows stone burr mills are cut from Balfour pink granite which is quarried in North Carolina. The millstones operate in pairs with a revolving millstone called the "runner" stone and a stationary millstone called the "bedstone." The millstones are set vertically, a feature unique to Meadows' stone burr mills. The surface of each millstone is a combination of "furrows" which are grooves cut into the face of the millstones, and "lands" which are the flat areas of the millstones. The furrows are deepest at the center, known as the eye, of the millstone and become shallower as they move towards the outer edge of the millstone. Looking at a furrow from the side (see image below) shows its two separate edges. The "back edge" or bottom of the furrow is the deepest cut. From the deepest point, the furrow tapers upward to meet the land at a point called the "feather edge." This is the cutting edge of the furrow. The lands are the areas of the millstone between the furrows and are the grinding surfaces of the millstone. As the runner stone moves across the surface of the bedstone the kernels of grain are carried up the incline to where the feather edges meet the lands. The sharp leading edges of the furrows passing over the corresponding edges of the other millstone act like the blades of a pair of scissors shearing the whole grains into smaller and smaller fragments. These smaller and smaller fragments of whole grain move from the center of the millstones to the outer edges during several revolutions of the millstone. The outer 6 to 8 inches of the millstones are called "the flouring of the stone" where the two surfaces are closest together, never actually touching, and the grain particles become flour. The finished whole grain flour falls from the edges of the millstones and is deposited in a holding container either by gravity or the action of a materials handling fan. Any product you intend to process in a Meadows stone burr mill should have moisture content less than 15 percent and should be free of natural oil. All Meadows stone burr mills feature a thrust and locking handle which allows the operator of the stone burr mill to control the texture of the grind. Due to its design the thrust and locking handle may be adjusted to produce flour with consistencies that range from very course to very fine. The capacity of a stone burr mill is determined by the size of the stone burr mill, the product to be processed, and the consistency to which the product is processed. The size of the stone burr mill is the diameter of the millstones. Meadows stone burr mills are available in the following sizes, 8 inch, 12 inch, 20 inch, and 30 inch. When selecting the appropriate size of stone burr mill you should ask yourself three questions. First, do I have a single-phase or 3-phase electrical supply? Second, what product do I intend to process? Third, what is my desired rate of production per hour? Electric motors up to 10-hp may be used on either single-phase or 3-phase electrical supplies. Electric motors larger than 10-hp may be used on 3-phase electrical supplies only. The 8 inch stone burr mill is driven by a 1-hp or 2-hp electric motor, the 12 inch stone burr mill is driven by a 5-hp electric motor, the 20 inch stone burr mill is driven by a 10-hp electric motor, and the 30 inch stone burr mill is driven by a 25-hp, 30-hp, or 40-hp electric motor. Electric motors and drives for 50-hertz electrical supplies are available. While all sizes of Meadows stone burr mills are designed to process any dry, free flowing grain and corn; some products such as Teff are processed most efficiently when using 20 and 30 inch stone burr mills. The chart below includes rates of production per hour for each size of stone burr mill. Meadows 8 inch stone burr mills discharge flour through a discharge spout that is cut into the bottom of the housings which surround the millstones. Meadows 12 inch stone burr mills discharge flour through a discharge spout that is cut into the side of the housings which surround the millstones. Meadows 20 inch and 30 inch stone burr mills may be configured so that flour discharges either through a discharge spout that is cut into the side of the housings which surround the millstones or into a materials handling fan. The materials-handling fan conveys the flour from the stone burr mill through a short length of four inch diameter pipe into a materials collector. 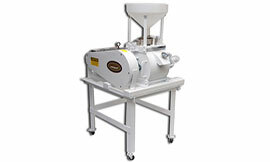 The flour falls from the materials collector into a sifter, a bagging system, or a brute. Brutes are containers which may be used to collect and store flour. The millstones used in Meadows stone burr mills require regular maintenance which is referred to as dressing the millstones. As millstones wear, the lands, or flat surfaces, of the millstone becomes smooth and the furrows become shallow. Dressing millstones is a three step process. In step one the lands of the millstone are cut with a bushing tool so that the lands are made rough. In step two the furrows are cut to their proper depth. In step three the millstones are aligned to one another. Some customers choose to dress their own millstones while others choose to ship or delivery their stone burr mill to our factory for service. If you choose to dress the millstones yourself Meadows Mills sells the tools necessary to perform the task. If you choose to dress the millstones yourself we recommend viewing our instructional video found below. Despite centuries of scientific advancement, the age old method of stone grinding remains the best grinding method known. There is a distinct difference between the grinding process of a stone burr mill and a roller mill. 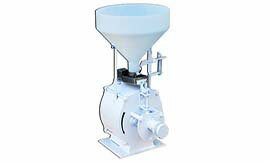 The action of a roller mill crushes the grain instead of shearing it into finer and finer pieces. Stone ground flour is preferred by many bakers and natural food advocates because of its texture, nutty flavor, and the belief that it is nutritionally superior and has a better baking quality than steel-roller-milled flour. Because the millstones produce less heat in the grinding process the wheat germ is not exposed to excessive temperatures that cause the fat from the germ portion to oxidize and become rancid, which destroys some of the vitamin content. 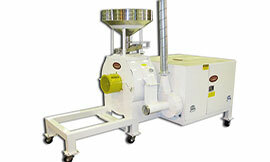 Stone milling retains more of the natural goodness and flavor of the grains. Treat yourself or your customers to a wholesome taste that will not be forgotten. 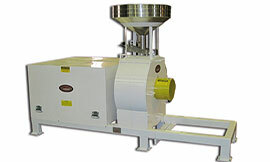 The variety of mill sizes available insures that you can select a mill that is perfect for you.